Pacific Island Countries: A cyclone-affected school welcomes children back to class. A cyclone-affected school welcomes children back to class. 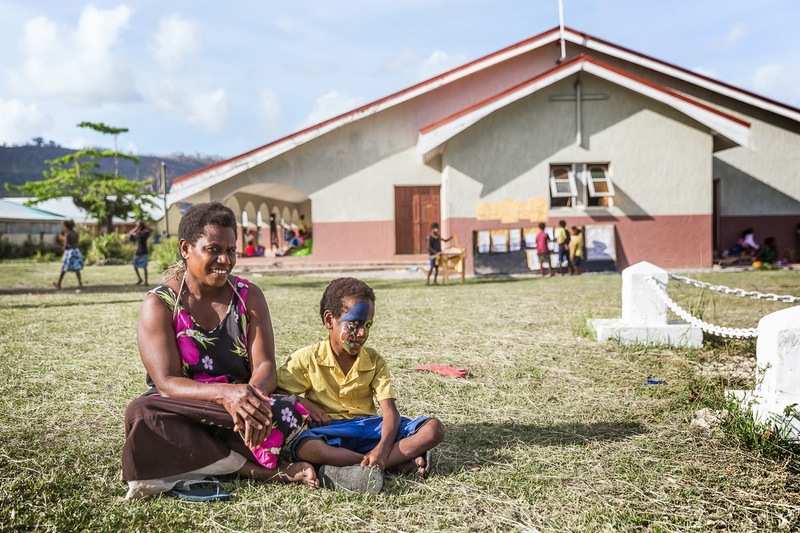 Dorah James and her eight-year-old son, Daniel at Mele Maat Primary School, Efate Vanuatu. Their home was completely destroyed by Cyclone Pam but Daniel is keen to return to school as soon as possible. First grade student Daniel Jojo (8) is pleased with the finished blue and yellow paint on his face and proudly shows it off to his mother, Dorah James. Yellow and blue are the colours of his school, Mele Maat Primary, on Efate Island, Vanuatu. Today, less than three weeks after Category 5 Cyclone Pam badly damaged the school, completely destroying four classrooms, Mele Maat Primary has opened its doors once again to welcome students, teachers and fami-lies. 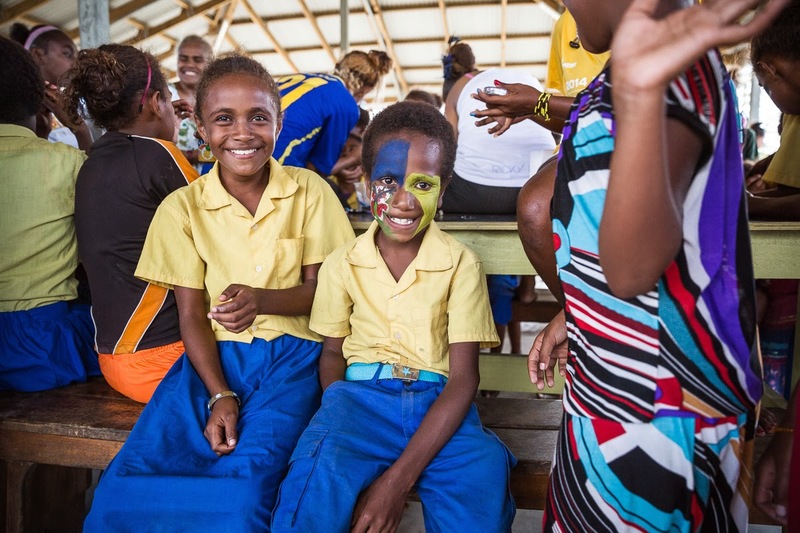 The students have not been to school since Cyclone Pam struck so the school has organized a special event that they hope will help the children to recover emotionally and think of the school as a safe space for them to come, learn and play. “I have four children and three of them come to school here. I’m anxious to send them back to school because we lost our home in the cyclone and we see a lot of damage everywhere. Even my Daniel’s class-room is gone so how can he learn, but if I keep my children away from school, it won’t help anything so I want them to come back to school. My children really want to get back to school quickly,” says Daniel’s mother, Dorah. Daniel’s family lost their home and most of their belongings to Cyclone Pam and are now living with Dan-iel’s aunt. He is also keen to get back to school. “We don’t have a home and there’s nothing much for me to do at home. I want to come back to school quickly,” Daniel shyly explains in Bislama. Eight-year-old Daniel Jojo with a school mate at Mele Maat Primary school in Efate, Vanuatu. Mele Maat Primary School held an event for students, teachers, and parents to encourage students to re-turn to school after Cyclone Pam. Mele Maat Primary School Head Teacher, Roy Charles explains that a lot of families are deeply distressed by the cyclone and are scared to send their children back to school. Nearly 30 students who attend this school had their homes completely destroyed and covered in thick mud from the river that flooded homes and destroyed food gardens. “So this event we organised is to get the families and community together so we can encourage each other, especially the students so they can return to school next week. I also want to show them that UNICEF gave us tents, school resources and more than 500 new backpacks with school supplies which we will use to help them learn in a sheltered environment once again” Charles explains. Even though their smiles mask a lot of stress and anxiety about the future, the parents at the school for the event are happy to see their children laughing and playing again. They’ve all contributed to the suc-cess of this important day by providing face painting activities, games, food and drinks for the children. Each family has a story to tell. They weren’t rich to begin with, and now all families have lost belongings, crops and even homes. But today, their focus is on their children, ensuring that all those affected by Cy-clone Pam return to school.